I had a blast cooking this hash on the Fox 40 Morning Show in Sacramento this morning! Bacon, yes bacon, can be a health food! If you shop for pasture raised organic bacon, it can be a nutrient dense part of your diet. I like to fry it up with a ton of vegetables. I have found that practically any combination of vegetables is delicious in bacon fat. Have some fun with it and experiment with different pairings. The great thing about this dish ids that you can cook once and enjoy the leftovers in a variety of ways. I like these veggies with eggs, on salads, and as a dinner side dish! When you cook your vegetables in a health fat source, it makes their wonderful nutrients more available for absorption by the body. 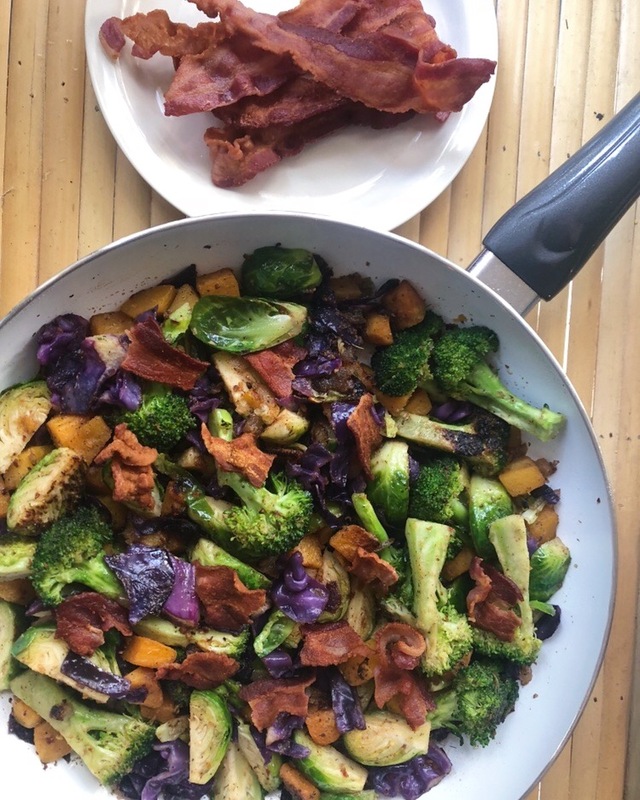 Specifically, fat helps with the absorption of the fat soluble vitamins A, D, E, and K. Using bacon fat not only cuts down on food waste, it also serves as a great substitute for vegetable oils. Vegetable oil, canola oil, corn oil, and soybean oil are made from unstable omega 6 fatty acids. Processing these oils into shelf stable substances that can hold up to high heat involves a lot of chemical additives. By the time they reach the stores, these oils are often already rancid. My number 2 tip to improving your health now is to eliminate vegetable oils from your diet. Your cell membranes are made up of fat, so eating quality fats can have a real impact on your health and vitality. Try using different animal fats, coconut oil, avocado oil, and for light heat cooking, try olive oil. - When the bacon reaches your desired crispness, place the cooked bacon on a paper towel to drain. Leave the bacon fat in the frying pan. - Add the rest of the vegetables to the pan and fry until the veggies reach your desired tenderness. This is usually around 6-8 minutes.